To live in San Francisco is to cherish urban life. Where and how you choose to live depends on your personal needs and values: do you choose a traditional San Francisco house with its individuality, generous space and garden? Or do you select the turnkey elegance, convenience and security of condominium life? 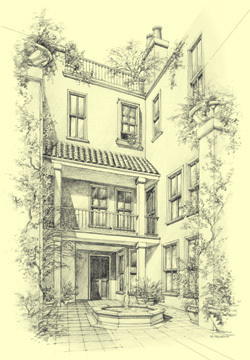 The design of 955 Green Street was conceived - simply and uniquely - to provide in one residence the best of both a large family home and a secure condominium. The homes at 955 Green are built on a single belief: fine architecture cultivates fine lives. Proportion, light, space - these intangibles are the greatest luxuries. A decade in the design process, 955 Green is the work of EHDD Architecture, winner of the American Institute of Architects' Firm of the Year Award. Its founder, Joseph Esherick, is a recipient of the AIA's Gold Medal, its highest honor. Configured on the model of an Italian hill town, the six homes are set around an open courtyard that fills their rooms with natural light. Each home has its own special entry. Each offers its own gracious floor plan tailored to varied needs and preferences. There are 3 large flats, 2 two-story town houses and a loft-style home (see enclosed plans.) While floor plans vary, all share the core values that define domestic life at its best. From formal entertaining to the minutia of everyday life, a home at 955 Green Street is designed to create a sense of ease. The circulation between rooms fosters effortless flow and interaction. Public and private spaces are carefully delineated. Bedroom suites serve as spacious refuges overlooking city views or gardens. All have marble or limestone bathrooms and large closets. Kitchens are laid out and equipped to serve as intimate family gathering places, casual entertainment hubs, or formal catering facilities. And for the homeowner who travels frequently or maintains multiple residences, these homes can be closed in minutes and left in full safety and security. From the depths of its foundations to the elegant, finished surfaces, every element at 955 Green has been analyzed, designed, and executed with an eye towards perfection and practicality. Built by the venerable San Francisco contracting firm of Cahill Contractors, the simultaneous assembly of six different, highly detailed homes in a single structure required an unprecedented degree of coordination between the designers, craftsmen, and suppliers.